Rich in its references to the teaching of the saints and Fathers, Unseen Warfare combines the insights of West and East into that spiritual combat which is the road to perfection. Staretz Theophan wrote in his forward: “The arena, the field of battle, the site where the fight actually takes place is our own heart and all our inner man. 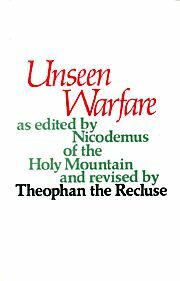 The time of battle is our whole life.” A classic in Orthodox spirituality. Softbound. 280 pp.